We have an oak staircase that never used to bother me until I happened upon Pinterest and it’s vast array of oh-so-easy DIY projects. 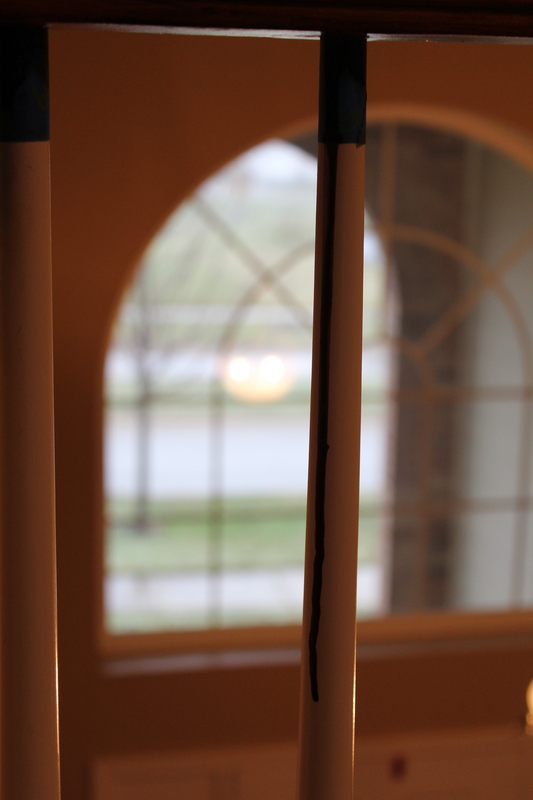 At first, I tried something simple like painting our oak fireplace white. Easy peasy. Then I painted our front door black. Pretty simple. 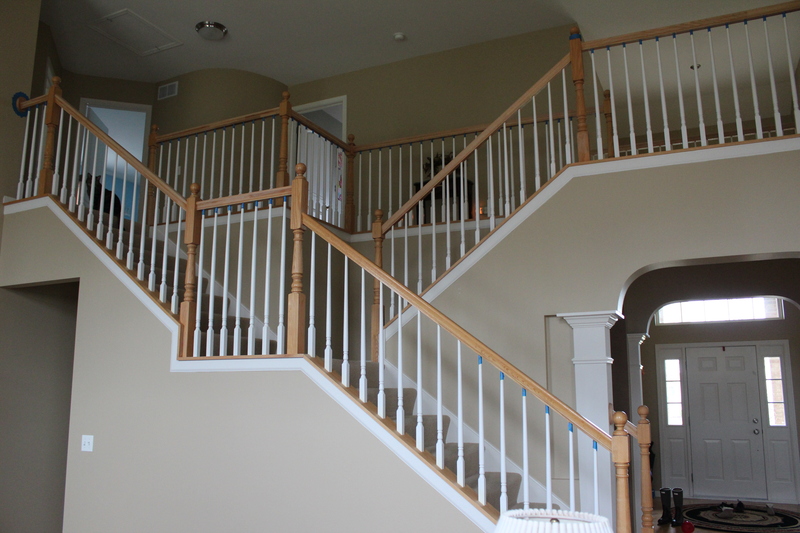 Then I saw how a woman transformed her blah oak staircase to a showstopping espresso railing with white spindles and I had to try it for myself. 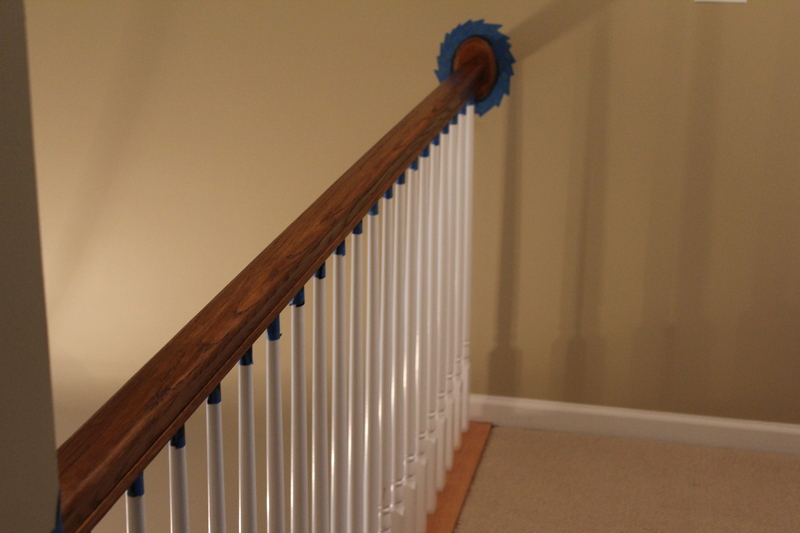 We already had the white spindles. After all, how hard could it be? The first part was sanding the blasted thing. We have a split staircase as you can see in the picture above so my husband was having a hard time getting into the grooves with the sander. FYI: we started this project in September as a thing we were going to tackle on the weekends. It is now the middle of November and our goal was is to get it done by Christmas. 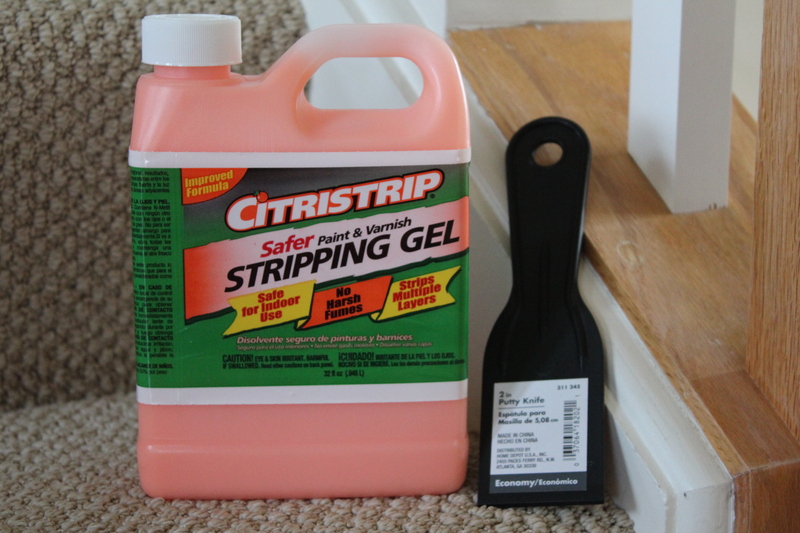 So then I tried using some stripper that was recommended by this DIYer. Bad idea. That stuff is goopy and a pain in the rear to scrape off! Then my husband had to sand it all AGAIN. Finally, I was ready to start staining. Folks, this job is not for the faint of heart. 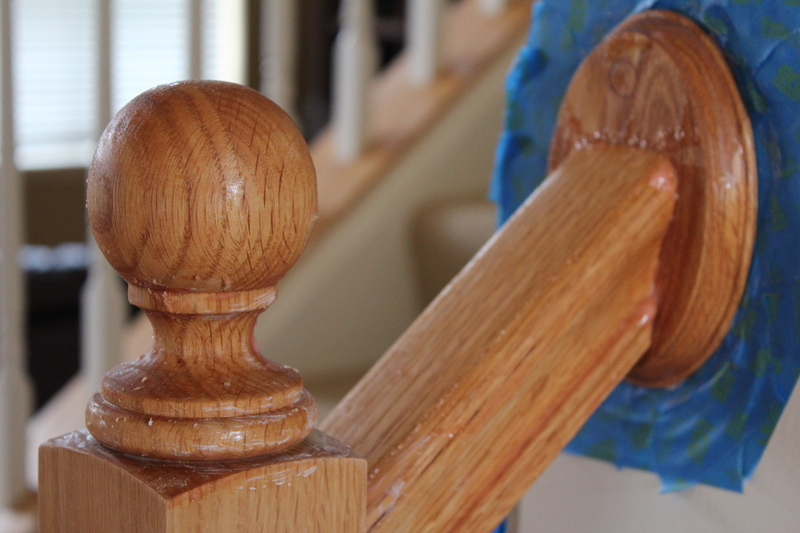 I almost had a panic attack when I saw how fast the stain was dripping down my already-white spindles. It was all I could do to suppress a scream while my three year old napped soundly on the couch downstairs. I quickly grabbed a paper towel, but this stuff was not rubbing off. So, I did what any normal girl with a nail polish collection does, I grabbed my nail polish remover and dabbed some on a cotton ball. Voila! It did the trick. Score one for the novice carpenter. This is what it looks like after the first coat of stain. I used Minwax stain and polyurethane in one and the color is espresso. Don’t see the espresso color yet, but I plan to use some steel wool and apply at least one more coat. Who am I kidding? It will be three coats. 1. Don’t ever do this yourself again. 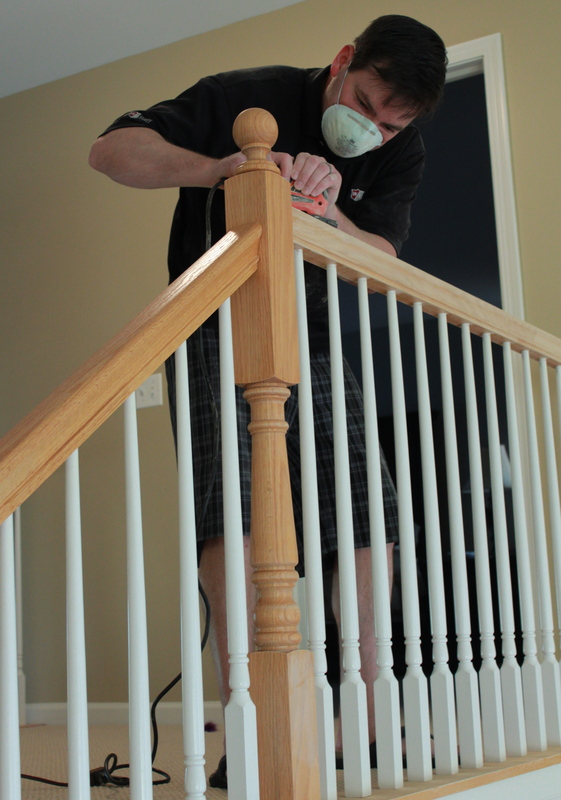 Just rip out the railing and replace it with hired help. 2. Stripper is a big no-no on blonde oak wood. Big waste of time. Just sand. This project WILL be done in time for Christmas. I am not a quitter and I will definitely keep you all posted.